Over the last year, MK Raina has staged Stay Yet A While and Hatya Ek Aakar Ki on Mahatma Gandhi. Now, he has turned Desai’s memoir into a musical play, Baabla Aur Bapu @ Sabarmati Ashram. On a chilly January day in Delhi, theatre director MK Raina met his childhood idol Narayan Desai, a famous Gandhian, and performer of Gandhi katha. Raina had grown up reading the Hindi translation of Desai’s book, based on his accounts of being a child at Sabarmati ashram. “I told him, ‘Would you allow me to make a play on it?’ He replied, ‘Where were you all these years? I was waiting for such an opportunity,’” says Raina. Over the last year, Raina has staged Stay Yet A While and Hatya Ek Aakar Ki on Mahatma Gandhi. Now, he has turned Desai’s memoir into a musical play, Baabla Aur Bapu @ Sabarmati Ashram. The play is by Sanskaar Rang Toli, the Theater-in-Education company of National School of Drama in Delhi and designed to travel to schools. It is being staged at Shri Ram Centre in Delhi till April 18. Raina’s stage comprises a charkha and a desk, the minimalism symbolic of Gandhi’s philosophy of simplicity and self reliance. The costumes are khadi, according to the rules at the ashram, and the incidents of the Father of the Nation going on long morning walks, running and playing with the children come from Desai’s book. Desai, whose father, Mahadev Desai, was Gandhi’s secretary, has recalled how any child in the ashram could write a letter to Gandhi and he would reply. “One child wrote, ‘Bapu, you always reply in a word or sentence. In the Bhagavad Gita, we learn that Arjun asks one question and Krishna responds with one chapter. Why are your replies so short. Gandhi’s reply comes, ‘Krishna has only one Arjuna but I have so many,’” says Raina, adding that songs were made to fit the theme. 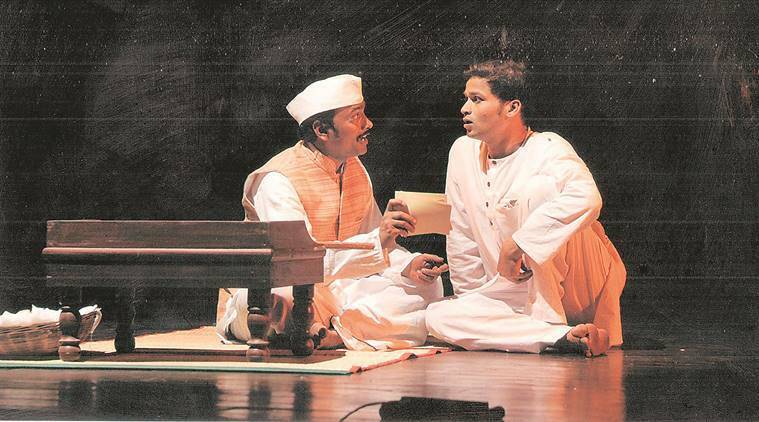 The play opens the window into Gandhi’s ‘Nai Talim’, an education form and social revolution. “It is a play about how Gandhi’s ideas transformed the children who knew him. These are ideas that modern schoolchildren should also know,” says Raina.